Cobra MR F45-D Class D VHF Radio Package With 8' Antenna And Mount is rated 4.3 out of 5 by 58. With the Cobra MR F45-D Class D VHF Radio Package, you can enjoy the water with peace of mind. Features the latest in Class-D Digital Selective Calling (DSC) Technology, including dedicated channel 70 (DSC channel) receiver, GPS position display capability, illuminated distress button, easy MMSI entry, position send and request, position input reminder, and Coast Guard DSC check capability. The Cobra MR F45-D provides access to all 10 NOAA weather channels for national hazard and weather information 24 hours a day and instant access to channels 16 and 9 for emergencies. The Dual Watch feature monitors channel 16 and a second, user-selected channel at the same time. Noise-cancelling microphone blocks background noise. The MR F45-D VHF radio also offers a signal strength meter, scan, illuminated keys, large illuminated LCD display, and dual output power at 1 or 25 watts for short and long communication. Submersible to JIS7 standards. Comes with mounting kit and GPS interface cable to connect your GPS receiver. 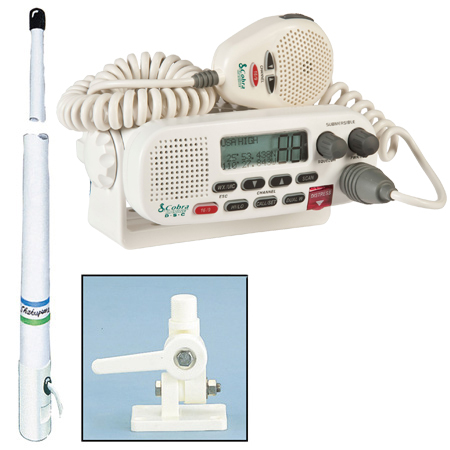 Package includes MR F45-D VHF radio, 8' fiberglass antenna, and nylon ratchet mount. 6-1/4"W x 2-1/4"H x 7-1/8"D.
Rated 5 out of 5 by jd50i from 6 years and still going strong Installed on my boat in 2009 and hasn't missed a beat. Works great and I connected my GPS to it for the added safety/convenbience of transmitting my position at the touch of a button. Rated 5 out of 5 by TOP. CAT from I was surprised in the range over 40 miles I called for a radio check after it was installed and picked up tugboat over 40 miles away from me at my house on the trailer. Can u imagine the range out on the water. Safety is the name of the game hope you never have to use it is the other. I fill safer now on the water then before and if you don't have one you can't go rong with this one.you need one and this one is one of the best.I love it and you will to,go get one R/B . Rated 5 out of 5 by Jimmy from Compete project no added Trying to match a radio with the correct antenna can get complicated. This unit came completed and ready to use. I am very impressed over the whole operation. I was completely satified with the purchase and delivery of the unit. I would suggest it for anyone that does not have the knowledge of radio installation. Rated 5 out of 5 by Team Bloodsport from Excellent Awesome value for the package. Super easy to install. Great reception with this radio. Rated 5 out of 5 by Mrbill from Great price on a necessity Replaced another brand of radio that failed after 14 years of use. The antenna was also getting pretty bad so I replaced the entire setup with this package. I reused my stainless antenna mount and installed the radio in the existing opening but I have a dash that closes and the microphone plug sticks out so far that I need to unscrew it before closing the dash. No big deal but inconvenient. Radio works fine and has good range and clarity. Does the antenna need to be tuned for the best SWR or is this built into the radio? Thank you for your question. No need to tune for SWR--regulated internally. NMEA 2000 OR 0183? Thanks. I see reviews and Q&amp;A'a for the&nbsp;Cobra MR F45-D Class D VHF Radio Package With 8' Antenna And Mount that are 6 and 7 years ago. Is this radio old technology? Unit is not old technology--its just that technology has not changed much in fixed mount VHF radios. Does this radio need anything else to give GPS location? Thank you for your question. This unit requires it to be connected via a NMEA connection to a NMEA enabled GPS/Charplotter to utilize the DSC/GPS function. How long is the included Antenna cable if it is included? Is the connector pre installed on the cable? If so, how big of a hole is needed to feed the cable through? Thank you for your question. Cable is 20ft-connector is not installed on cable but is included. Is running on batteries an option for this radio? Does it plug into a boat cig lighter? This Radio Has to be hard wired in to your 12Volt system. This Radio is mainly used for boating.